Wildcoast Adventures Ltd. will not provide a refund if you must cancel your trip due to last minute medical reasons. Therefore the property recommends trip cancellation insurance. Trip cancellation insurance covers you if you have to cancel because of medical reasons. Tip: Check with your credit card company, sometimes they have this insurance included. accepting from Wildcoast Adventures a full refund of all monies paid for the cancelled trip. Wildcoast Adventures is not responsible for any incidental expenses or consequential losses that may have been incurred as a result of the cancelled booking such as, but not limited to, non-refundable plane tickets or other travel costs, equipment, etc. Wildcoast Adventures reserves the right to issue a full refund in lieu of the choices above, in its sole discretion. Wildcoast will make every reasonable effort to contact you as soon as possible if it appears that a trip may be cancelled. There are no accessible disability/wheelchair units. Smoking is not allowed inside or near the unit. There are two locations where guests can meet the water taxi for their trip to camp. If guests are staying in Campbell River, BC the night prior to their departure to camp, they should meet the water taxi at 8:00am at Fisherman's Wharf (look for the Discovery Launch Water Taxi sign). If guests are staying on Quadra Island, BC the night prior to their departure to camp, they should meet the water taxi at 8:10am on the Gowlland Harbour Resort docks. Boat ride to camp departs from Campbell River at 8:00am and Gowlland Harbour on Quadra Island at 8:10am. Wildcoast can arrange accommodations in one of these locations the evening prior to departure to camp if desired. There will be expert guides to brief guests about their boat ride to camp. The 2.5 hour journey passes through the Discovery Passage and the infamous 'Seymour Narrows'. Sightings of porpoises, dolphins, and whales are common even before reaching camp. Arriving at camp, guests will be greeted by camp staff to help settle into their new wilderness accommodations. Wildcoast Adventures offers guests a remote camp situated next to the Robson Bight Ecological Reserve, a killer whale sanctuary and home of the famous Orca Rubbing Beaches. Whether guests are up early watching for orcas from the beach or heading out for a sunset paddle, they will find the perfect blend of thoughtful exploration and wilderness serenity. Trips begins with an exciting water-taxi ride to the Wildcoast’s remote camp. Each day, guests will ride kayaks to seek out wildlife including whales, bears, sea lions, and porpoises. Morning, afternoon, and sunset paddles provide opportunities to learn about inter-tidal sea life. Spacious safari tents in the remote rainforest ensure that guests remain comfortable during their adventure. Delicious gourmet meals made with local ingredients are served daily in the camp’s large wood-heated common area where guests congregate after each day’s outings. In addition to daily sea kayak excursions, guests also enjoy hikes, a native sauna, and evening campfires. 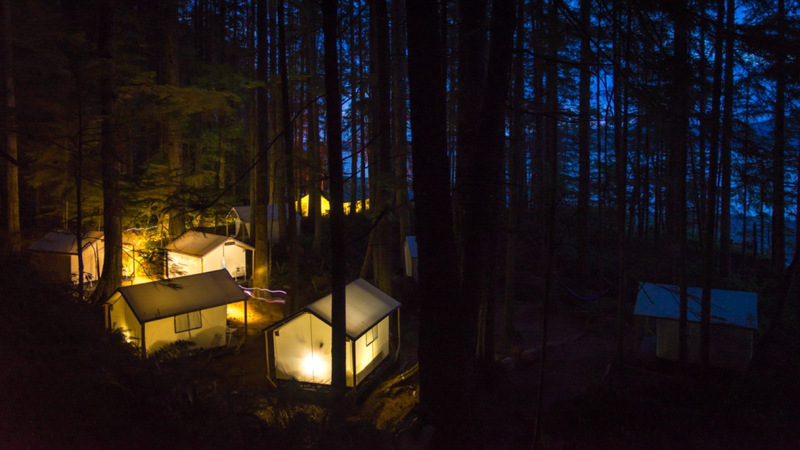 The twelve tents are located on the Robson Bight Ecological Reserve, a great mixture of thoughtful exploration and wilderness serenity. Tents come with either one queen bed or two twin beds, which are all equiped with high-quality, warm and cozy bedsheets and bedside lights. Guests have access to the hot water shower on the beach as well as a separate washup station. From accommodations to gear, the property provides comfort and enjoyment in the midst of the vastly untouched British Columbia wilderness. Included in your rate is the boat ride to and from camp, all kayaking and camping equipment, bedding, all meals and non-alcoholic beverages, guiding service, and park permits. Please note that no alcohol consumption is permitted prior to or during water excursions. You are welcome to responsibly enjoy any alcoholic beverages you bring with you during other times at camp. Guides take pride in preparing wholesome, fresh daily meals from a menu created by a gourmet chef. Local fare, including salmon and locally grown vegetables, are all part of the coastal cuisine. Special dietary requests are easy to accommodate. Let the property know of any restrictions when booking, and they will ensure that their cuisine meets the needs of their guests.